Dr. James Osborne received his doctorate in archaeology from Harvard University in 2011, specializing in Near Eastern Archaeology. He was a Mellon Post-doctoral Fellow at Johns Hopkins in 2012-2014. The objects on display at the museum. The ceramics shown here derive from the southern Levant, a region that today includes Israel, Palestine, and Jordan. Levantine vessels like these helped Sir Flinders Petrie (1853-1942) invent the seriation dating technique, which places pottery into a chronological sequence based on changes in shape and decoration, and which is now used by archaeologists worldwide. As Petrie and his followers identified, many of the vessels in this display are highly diagnostic of their time periods. The vessels displayed at the museum span nearly four thousand years, with the earliest—such as the tall ‘cornet’ (INV 1)—dating from the Chalcolithic period, ca. 4500-3300 BCE. Early Bronze Age was characterized by the dawn of urbanism in the Levant and close economic interaction with Egypt ceramics; this is attested by the small Abydos ware juglet (FM 22). The Middle and Late Bronze Ages (the second millennium to ca. 1200 BCE) saw the first widespread use of the potter’s wheel, allowing the potter to make innovative shapes with carinations, or sharp changes of direction in a vessel’s profile. 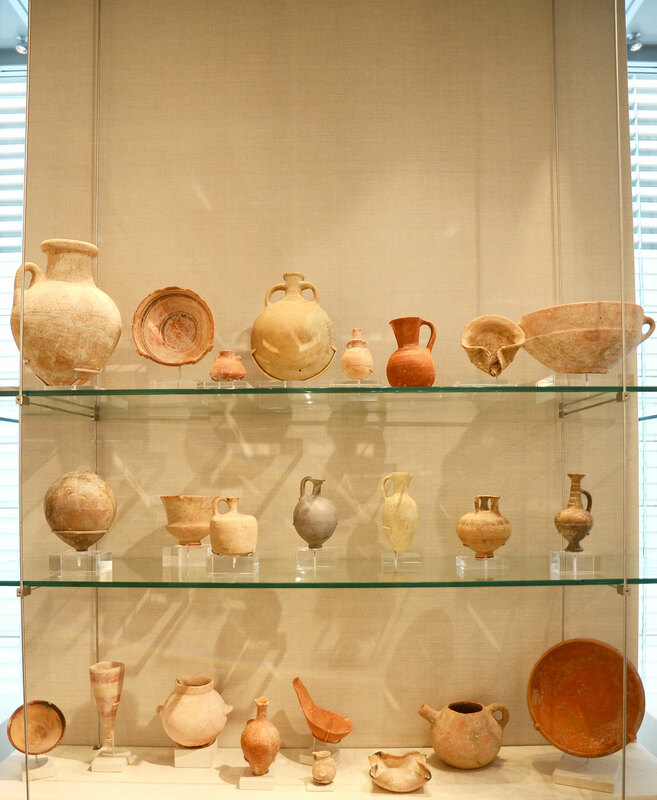 Typical examples from these periods include the Tell el-Yahudiyeh Ware jug (FM 49) and the oil lamp (FM 53), respectively. The Iron Age, which ended in the middle of the first millennium BCE, is represented by a tiny juglet (FM 73); such vessels were in use during the time of the kingdoms of Israel and Judah known from the Hebrew Bible, or Old Testament. Although their original findspots are unknown, it is very likely that most, if not all, of the vessels displayed at the museum come from funerary contexts. This is because ceramics from tombs and burials are generally found intact, or nearly so, quite unlike the broken pottery sherds typically found in excavations. Whether or not the vessels would have been used before placement in a burial is unclear, but likely they were left as grave offerings for the deceased. Some, like the oil lamp (FM 53), may even have been used inside tombs as part of funerary rituals. Most of the objects in this display were donated to the museum by Frank and Joan Mount who collected these artifacts while living and traveling in the Middle East in the 1960s.